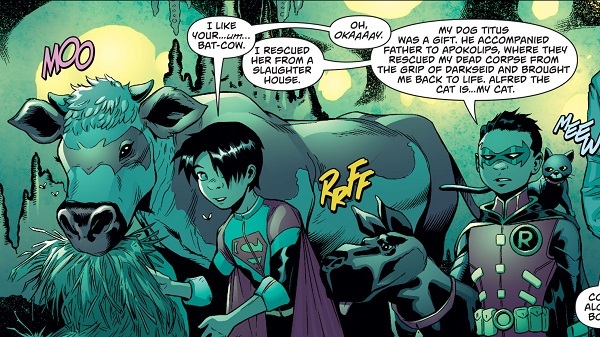 When a dog seemingly with Kryptonian powers appeared in Smallville, Superboy discovered his dog from his infancy Krypto which was sent to Earth by his father Jor-El as a test subject to see if it was a viable escape strategy. 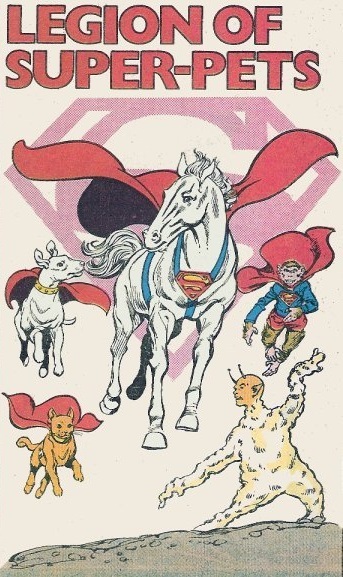 The super-pet proved a popular addition which unleashed a wave of super-animals in the Man of Steel’s world. The gorilla Chandu, Super-Bird, Super-Ape, scientist turned gorilla King Krypton, Fuzzy the Krypto-Mouse, Beppo the Super-Monkey… even Supergirl gained a pet in Streaky the Supercat. It wasn’t long before there were enough super-powered animals to form a team resulting in the Legion of Super-Pets which introduced another animal companion in Comet the Super-Horse. 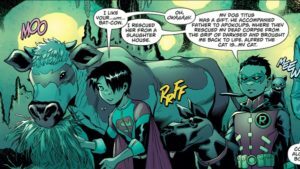 When Superman created a Batman-inspired identity in the Bottle City of Kandor in Nightwing, he even adopted an animal companion in Nighthound just for those adventures! 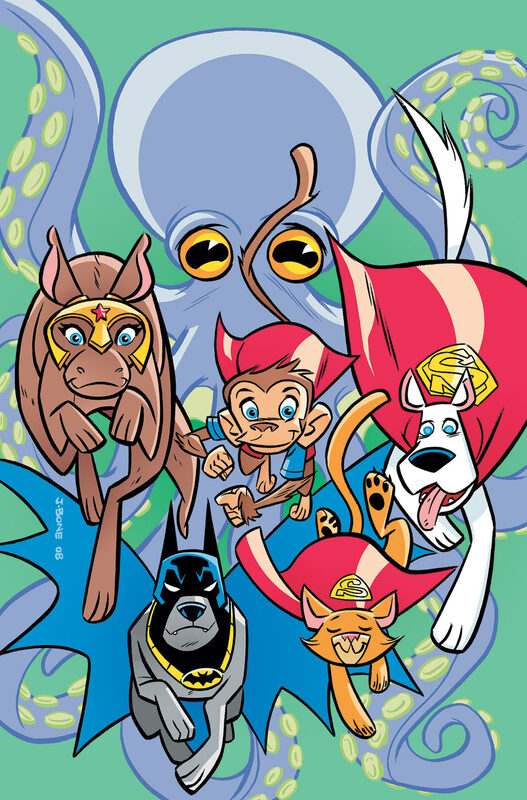 Krypto became so popular, he gained his own team of alien heroes in the Space Canine Patrol Agents (as Streaky gained the Space Cat Patrol Agents). For the Superman Family, it seemed as though the phenomenon finally died down around the time Yango the Super-Ape appeared for his first and only time. Robot Chicken went so far as to parody the menagerie of animals for a skit involving the Legion of Super-Pets with their own original addition in Hissy the Super-Snake. Superman, however, wasn’t the only superhero to have a veritable army of animal allies. By nature of his superpowers, it makes sense for Aquaman to have numerous animals at his beck and call. As Dr. Mid-Nite and Hawkman found success with their avian allies, Aquaman adopted a sea lion by the name of Ark on his adventures. 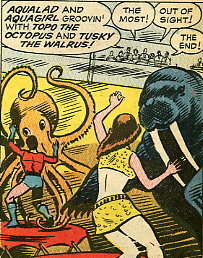 Sadly, Ark wouldn’t last long and in the Silver Age after Superboy gained Krypto, Aquaman found another sea friend in the octopus Topo who had significantly more staying power. When Aquaman was relaunched however, he gained a different companion in Porpy the Porpoise while Aquaman’s partner Aqualad soon gained his own ally in the seahorse mount Sea Imp. When the Aquaman animated series premiered on television, many of its episodes were written by the comics’ authors as the show adopted a walrus named Tusky and both Aquaman and Mera gained their own seahorse mounts (Storm for the former and an unnamed pink variant for the latter) while Aqualad kept Sea Imp (dropping the ‘Sea’ from the name, though). It was only a matter of time before Tusky and Storm transitioned to the comics until Aquaman experienced a dip in popularity following his portrayal on the Super Friends animated series. It wouldn’t be until after the Crisis on Infinite Earths that another animal ally joined the cast in Porm, a dolphin that retroactively became Aquaman’s surrogate mother when he was a baby. Following the events of Flashpoint, Aquaman gained another animal companion in Salty the Aquadog. 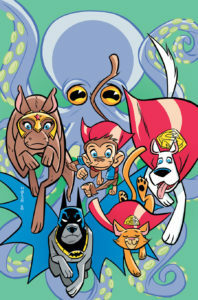 Given their success on Tiny Titans, Franco and Art Baltazar developed a Super-Pets brand that introduced even more sea friends in Mera’s pet Geoffrey the Hammerhead Shark, Aqualad’s Fluffy the Goldfish, Nicoletta’s Betty the Baby Beluga, Jeremy the Jellyfish, and Jimmy the Mussel. While Superman and Aquaman likely have the biggest animal families, Batman undoubtedly deserves inclusion in their company. When Krypto became a hit with fans, Batman soon found himself with a canine companion in Ace the Bat-Hound. When engraver John Wilker was kidnapped, his trained animal companion Ace was essential in his rescue and from time-to-time, Batman borrowed the so-called Bat-Hound for his adventures. When Wilker later took on a job that would keep him on the road most of the time, Batman adopted Ace as an ongoing ally. As the Silver Age wound down, Ace faded into Limbo but Batman would add another animal to his Family before then. When Batman was summoned to the Republic of Montegua to combat crime boss El Papagayo, he recruited and trained a local man named Luis Peraldo to become Bat-Hombre, the Batman of Montegua. While Peraldo was revealed to be an agent of Papagayo, his animal companion Bat-Horse aided in the capture of both villains (along with Papagayo’s parrot Toto). The closest Batman came to a significant animal appearance in his books for decades afterward were the bats in his Batcave or the experimental bat of Kirk Langstrom that crashed into his study inspiring Bruce Wayne to become Batman retroactively. Everything changed when Damien Wayne adopted the mantle of Robin and brought a parade of creatures through Wayne Manor’s doors in Titus the Dog, Bat-Cow, Alfred the Cat, and Goliath the Dragon Bat. 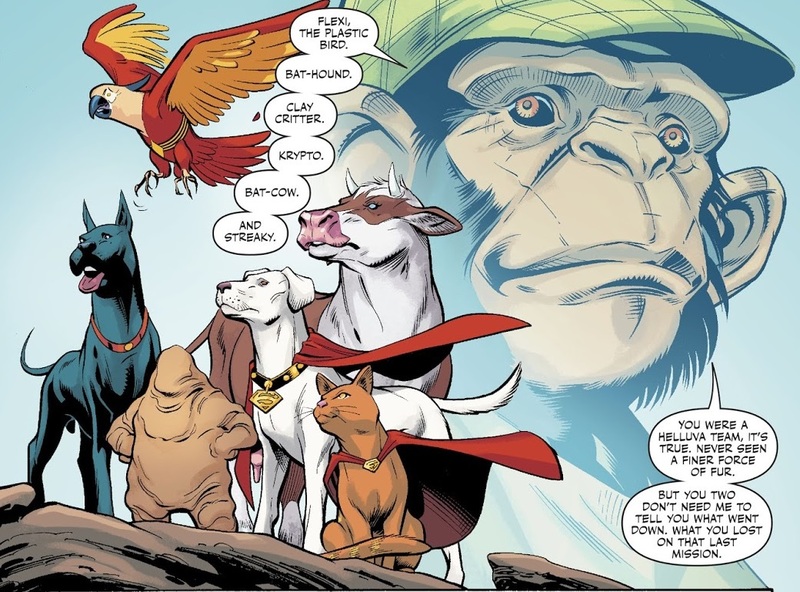 Other members of the Justice League also adopted animal companions. On the mystical island of Themyscira, the Amazons employ as mounts flying kangaroos called Sky Kanga with Wonder Woman’s trained mount named Jumpa who, around the time of Hooty, Big Red, and Ark, came to be her animal companion. While Wonder Woman is able to communicate with animals, she generally avoided such companions until ten years ago when she was targeted for execution by Gorilla Grodd. Having genetically altered albino gorilla knights, Grodd sent a troop of these soldiers to eliminate Wonder Woman only for them to instead befriend her. Under the pledge of their leader Tolifhar, the group swore to make up for their misdeeds in the heroine’s service. Recently, a group of Super-Pets emerged with a mysterious Clay Critter among their number (which had a strong resemblance to Chameleon Kid’s pet Proty but of a different color). Sadly, the creature lost its life so it’s unlikely we’ll ever know its origins though some believe it maybe from the same clay that gave Wonder Woman life (though this origin has since changed making it unlikely) or could be an offspring of the family of Batman villains to assume the name Clayface. The Flash was the hero that discovered Gorilla City and befriended its ruler Solovar who became an infrequent ally to the hero (the TV Flash had a turtle named McSnurtle after the aforementioned Whatzit’s civilian identity). Green Lantern Hal Jordan for a time found a pet in Itty, a starfish-like alien that aged to adulthood and moved on. While Green Lanterns like Ch’p, B’dg, and G’nort bear a resemblance to animals from Earth, some have mistaken them for pets (which has been played for laughs at times). The Atom used a bird he saved and outfitted with prosthetic wings (thanks to Hawkman) named Major Mynah as a mount for a time. Martian Manhunter adopted a strange alien creature for a time named Zook (which post-Crisis was re-imagined as a Martian-based symbiotic plant called Zo’ok which acted as shapeshifting apparel for Green Martians). Franco and Art Baltazar attributed a pet to Plastic Man in Plastic Frog but the same story that produced Clay Critter provided him instead Flexi the Plastic Bird. While not his pet, Elongated Man is close friends with Detective Chimp (who has a best friend in Rex the Wonder Dog where both drank from the Fountain of Youth for renewed youth and the ability to speak). Along similar lines, Mr. Tawky-Tawny is a humanoid tiger and longtime friend of Captain Marvel but following Flashpoint, he is now a tiger at a local zoo and friend to Shazam. 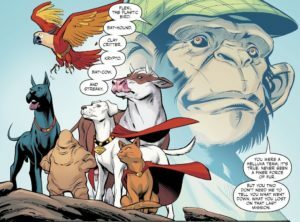 The League rounds out its family of pets with Green Arrow’s porcupines Quiver and Quill, Black Canary’s canary Pierce, Red Tornado’s Tasmanian devil Dusty, and Zatanna is known to use rabbits, doves, and a white tiger in her shows. This entry was posted in Comics and tagged DC Comics, Jerry Whitworth, Super-Pets. Bookmark the permalink.